A new website has been launched by former world champ Dave Wesson, allowing its users to download videos of their favourite anglers directly to their PC. Fishy Films contains videos for both match/coarse and carp anglers and currently features anglers like Phil Ringer, Alex Bones and Derek Ritchie in videos ranging from 3 minutes to 20 minutes long. The videos are exclusive to Fishy Films and have been shot by Dave himself who makes them all very informative and content rich by asking the anglers key questions thoughout each video. “I’ve wanted to create a site like this for a long time,” he explained. “It’s taken a while for me to build and develop but now it’s up and running I can concentrate on capturing more videos to add to what’s already there. If my videos prove popular I’ve got some other ideas in the pipeline to take the site to the next level… but one step at a time! Videos are available in either Windows WMV or QuickTime MPEG-4 formats and range in price from 0.75p to £2.49 per download. Each video has its own trailer. 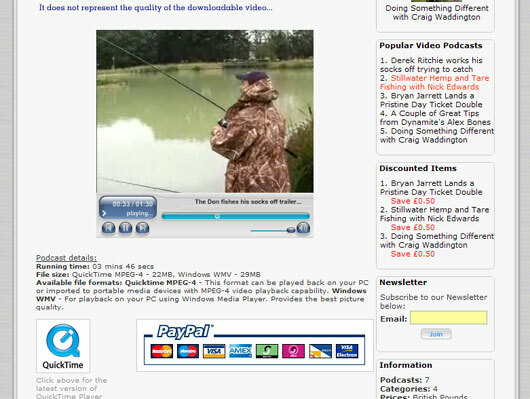 You can start downloading Dave’s videos at www.fishyfilms.net <http://www.fishyfilms.net> – definitely well worth checking out.